The Libraries at the University of Wisconsin-Milwaukee supports a modern, metropolitan university in its unique urban mission and program emphasis. Located in the heart of the campus in a single, centralized facility, the library maintains extended hours of access to serve UWM students, faculty, and researchers as well as members of the larger metropolitan community; a total of nearly two million visitors annually. 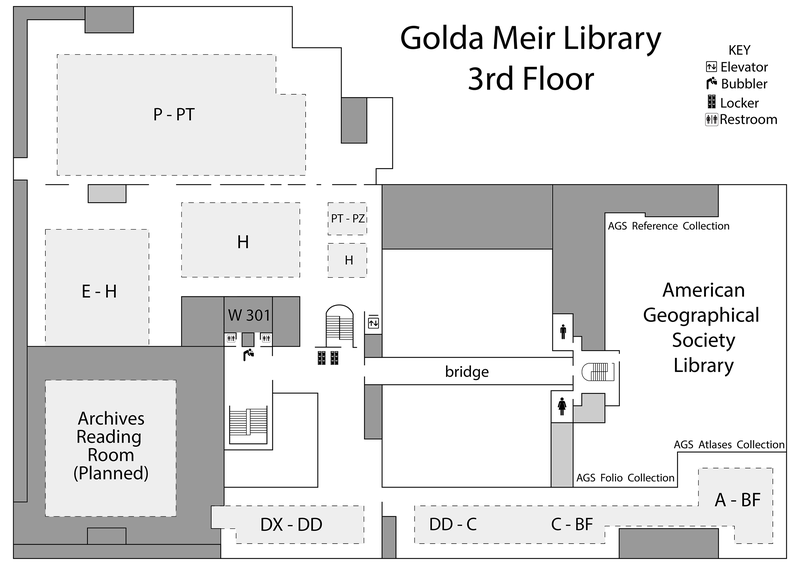 The building (the physical building is called the Golda Meir Library) was constructed in three stages. Stage I was completed in 1967, Stage II was completed in 1974, and Stage III in 1987. Current library space is 379,000 square feet (approximately nine acres), which includes 2,440 student stations and 209 faculty carrels. The Library is physically divided into five floors, labelled Lower Level and First through Fourth Floors, plus an additional Green Roof Project. For specific room number information, refer to the Campus Planning and Management Room Number Floor Plans site. 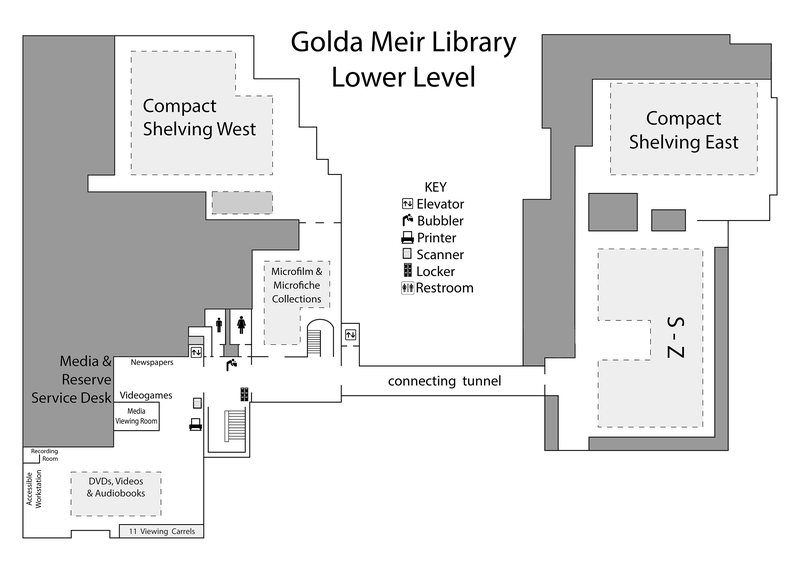 For information on library holding locations, see our Location Guide. 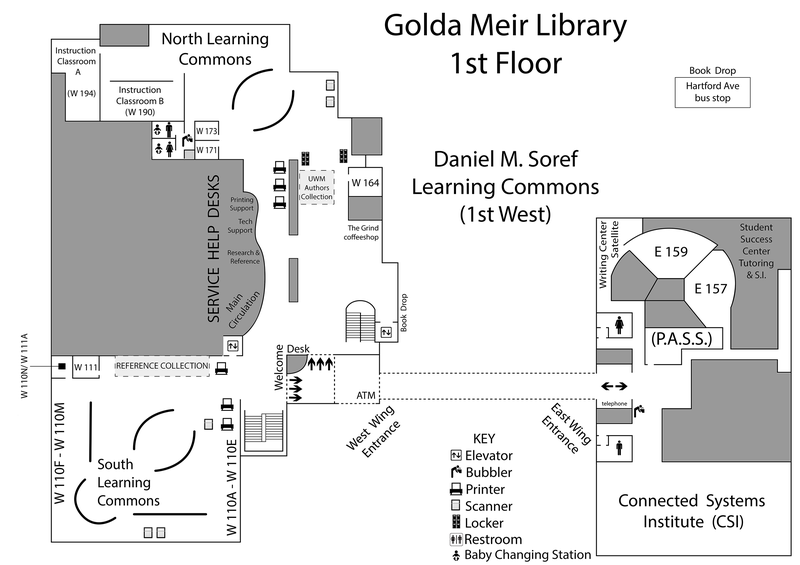 Restrooms are located in the Daniel M. Soref Learning Commons; off the main stairwell on the lower level, second floor, and third floor of the west wing; on the first, second, and third floors of the east wing; and on the fourth floor. 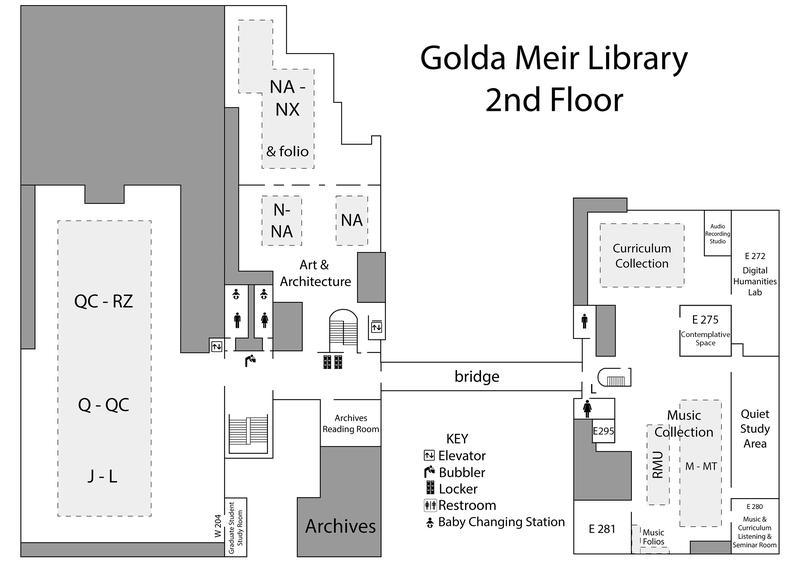 Gender inclusive restrooms are located on the 3rd Floor in the West Wing of the Golda Meir Library. See UWM Gender Inclusive Restrooms for more information. The Lower Level is in both the East and West building sections, connected by a tunnel. 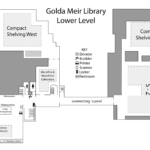 Located in the Lower Level West Wing is the Media and Reserve Library, the Microforms Area, a large study area, and Compact Shelving West (an area filled with high-density mobile shelving having call numbers A through P). The Lower Level East Wing is home to call numbers S through Z and Compact Shelving East (an area filled with high-density mobile shelving having call numbers Q through Z) and is accessible only from the Lower Level West Wing via the tunnel. The First Floor has two sections. The First Floor East Wing features a Study Area. 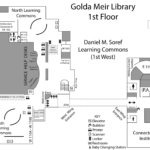 The First Floor West Wing contains the Daniel M. Soref Learning Commons. The Grind, located in the Daniel M. Soref Learning Commons, serves Colectivo coffee drinks, teas, juices, and bakery items. Also located in the West Wing are a large campus computer lab, Circulation, Interlibrary Loan, User Services (including Government Information and the Reference Collection), Library Administrative Offices, and Personnel. The Second Floor consists of the East Wing and the West Wing connected by a bridge. 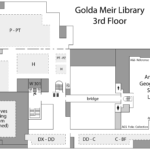 In the Second Floor, East Wing are the Curriculum Collection (materials in the Curriculum Collection are cataloged/classified using the Dewey Decimal system), the Music Library (which includes call number M of the main library collection), and the Digital Humanities Lab. Also included are Technical Services and the Library Business Office. 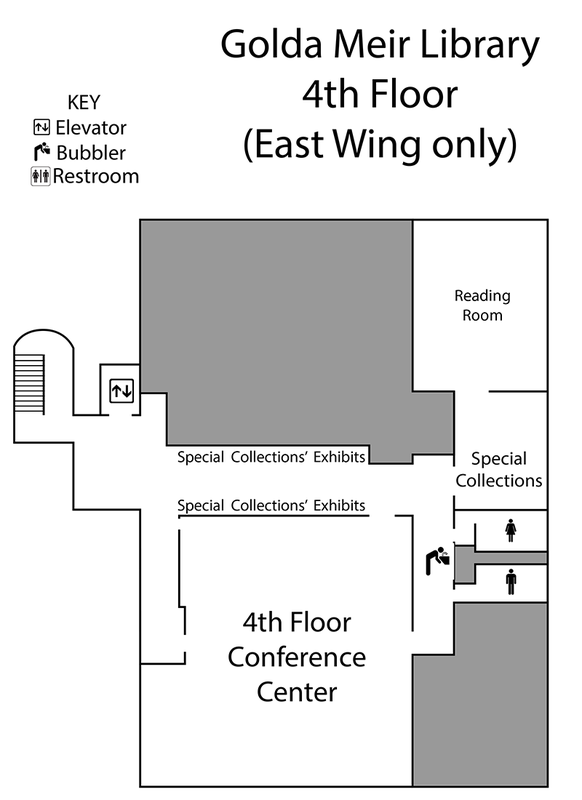 The Second Floor West Wing is home to the Archives, the Scriptorium, and call numbers N, Q through R.
The Third Floor is in both the East and West building sections, connected by a bridge. The West Wing houses general stacks call numbers A through L, and P. The East Wing is occupied by the American Geographical Society Library. 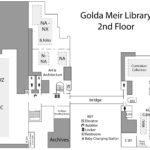 Please note, all AGS Library circulating materials are shelved on the lower level (Map of AGS Library Materials). 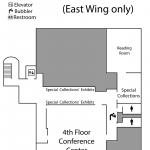 On the Fourth Floor are found the Special Collections area and the Library Conference Center. Down the main hallway of the Fourth Floor are a series of display cases, filled with continually changing displays. Building tours are available to the general public. See the Library Tours and Workshops page for more information.